This is the first time I’ve read T.A. Chase as a solo writer (instead of the books she writes with Devon Rhodes). 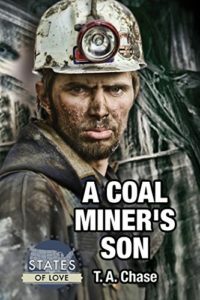 I loved A Coal Miner’s Son, which is the West Virginia entry in Dreamspinner Press’ States of Love series. The blurb drew me in–a story about two men from vastly different backgrounds finding love. James Callahan and Cai Rees have known each other forever. When he was young, James came to Willow Hollow with his father, the owner of the town’s coal mine (and for that matter of the entire town). James befriended Owain Rees, Cai’s younger brother, at a young age and the two remained best friends and hang out together when James is in town on mine business. Cai, however, has never felt comfortable being friends–or more–with the boss’ son. What I loved about this book is that Cai and James weren’t brought together in any of the ways I thought they would be. I don’t make it a point to try and guess things about plots, but for this one I had some ideas on how I figured it would go down–and it didn’t happen that way at all. The way the men came together was perfect and the lead up to the moment their connection was made had a nice buildup. I enjoyed the setting of the book–out in rural coal country. The peek into that life, as well as James’ desire to live there because he’d always felt more connected to Willow Hollow rather than the fancy, rich surroundings he grew up in, gave the book a lot of depth. This is not the normal setting for contemporary gay romance (at least not that I’ve read) and that was one of the things that drew me to this book… and made me love it so much.